The Painted Pony Resort is a 750 acre high desert Resort and Ranch in Hidalgo County of southern New Mexico just up the road from Rodeo, NM. This unique and isolated part of the country is known as the boot heel of New Mexico. The Painted Pony Resort is a plush, comfortable desert retreat economically priced for Family Reunions, Weddings, Business Retreats, Workshops, Conferences, Stargazing and Astronomy, Private Events, Artist Getaway or any group looking for a comfortable get away. We are situated in the San Simon Valley of SW New Mexico with breath taking panoramic views of two mountain ranges boarding the property: Chiricahua and Peloncillo Mountains. The PPR, provides you and your guests with space to enjoy privacy while also having large areas for mingling and getting together for dinners, parties and other events. The PPR compound consists of Main House, Two Guests Houses, Events Building (Airplane Hanger), Swimming Pool and Six RV Pads. 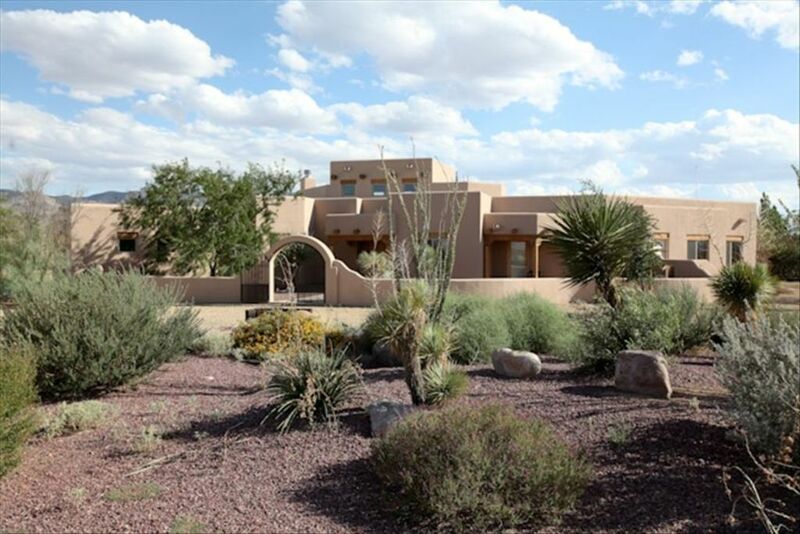 We offer privacy, spectacular Southwest experience and plenty of room to stretch out. Our Guests are impressed with the quiet, peaceful setting and the natural beauty of our night sky. We have skies that are clear and dark enough to explore the many fascinating jewels of the night. PPR is far removed from the pressures of the urban environment. Being off the beaten path our Resort is the perfect place to unplug. State land borders the north and west sides of the property and federal lands cover the mountains both east and west, creating vast open spaces with quiet solitude. Our most popular venues are Family Reunions, Business Get-Aways, and Weddings. We rent to only one group at a time so you do not share the Painted Pony Resort with others during your stay. Your wedding with us could include the beautiful, new and fully equipped Chiricahua Desert Museum Event Center for the reception and wedding. We coordinate bands, catering, flowers, and do other services for you or you can do them yourself. Our Professional Local Property Management Company with full staff can also provide custom services at your request. These service include Airport Shuttles, Catered Food, Tours of the Area, Movie Viewing, Museum Tours, Chefs, or just about anything else you may need. * Outdoor pool, outdoor fireplace and hot tub. If you have a large group we can help you with overflow rooms with local vendors or you can camp on the property. We do all the work for you to find additional accommodations. We hosted a wedding with over 100 guests staying in the Valley. Pricing based on the size of your group. The Chiricahua Desert Museum Event Center and other special services are not part of the basic rental. We arrange for your extra services through our Estate Manager. We can do many things in including hikes, horseback ridding, catering, room turn down, etc. Wedding Basic Package: For $4,000 you can stay 3 nights and have up to 24 guests. We live in Northern VA and fell in love with the peaceful isolation of the NM desert in an area they call the Boot Heel of NM. The picture is from our own family reunion at the Painted Pony Resort. We purchased this property in 2009 to create memories with our children and as an investment. Over the years we've had incredible times. Our kids learned to hike, horseback ride, explore nature and grow up together. The Pained Pony Resort is a great choice for the budget conscious who want the Southwest Desert experience. Weddings can be done economically using locals for food and other services. For family reunions, it is a great place for everyone to re-connect. We love PPR for its beautiful setting and the calm and peaceful spirit it promotes. This is a perfect place to get away from the rat race and recharge. Small to medium sized groups, artists, astronomers and university staff on sabbatical have come to hold their meetings at PPR. You will find that our facilities are economical and you and your guests will love the quite beauty. toilet, combination tub/shower, Shared between Bedroom 4 & 5. Grab bar for toilet. 6.5 bathrooms. The En Suite Master bathrooms for the main house and guest house have large walk in closets. The En Suite Master bathroom for the Wedding Bungalow is super sized with large double shower, large tub facing mountains, and unbelievable walk in closet (with 4 bunks) that is perfect for weddings or extra space for roll away bed sleeping area. 700+ acre high desert ranch situated in the San Simon Valley with breath taking panoramic views of the Chiricahua and Peloncillo Mountains. Resort with 13 Bedrooms, 7.5 Baths A plush, comfortable desert retreat economically priced for Family Reunions, Business Retreats, Workshops and a Wedding Destination. Situated, literally at the end of the road, 5 miles north of Rodeo, New Mexico and at an elevation of 4000 feet, PPR is far removed from the pressures of the urban environment and off the beaten path. In a valley surrounded by two beautiful mountain ranges. In main house using internet with free long distance. Local cell phone access too. All buildings are air conditioned. Event Buidling uses two swamp coolers for air conditioning and a contractor heating unit for heating. All buildings are heated. Separate controls for each building. Beautiful out door fireplace off the main house. Fireplaces in Main House, and Guest House. All the parking space you would ever need around the buildings of the Resort. 3 car garage plus airplane hanger. Pool table and ping pong table in 3 car garage and basketball hoop at the Events Building. Wi -Fi in all buildings. Full set of towels provided. Pool Table, Basketball, Ping Pong, Horseshoes, Water Polo Ball, Bocce Ball Set, Ladder Toss Game, Volleyball, Lots of Places to Hike and Walk on our 750 Acres. DSL access through wireless connections though out estate. Large Great Room in the Main House. Nice living room in the Guest House. Very nice waiting area in the Bungalow. 2 - main house and guest house. (3) Refrigerators both main house, guest house and have refrigerators, an Additional large commercial fridge in main garage. Large commercial ice maker in the main gargage. (2) main house and guest house have stoves. 2 ovens - main house and guest house. Coffee Makers in all three buildings. Toaster in Guest and Main buildings. Many standard pantry items avaialable. Full compelment of pots and pans, dishes, cooking utensils, silverware and everything you need to enterain a large gathering. Dishes and utensils in main house, guest house and cabin. Dining areas in Guest House, Main House, Court Yard and Events Building. Full surround sound with large screen in Great Room of Main House & Master Bedroom. Bungalow and Guest House also have large screens and surround sound. (4) Four Direct TV Receivers and five large flat panel screens. In the Main House Garrage is pool table and pin pong table. Basketball area at the airplane hanger. Expansive Patio and Courtyard areas ideal for large gatherings. All buildings are one story. Large 20x35 with lots of outdoor space and furniture. Solar heated with Geothermal assist. Next to Court Yard and Swimming Pool. PPR Features: * Furnished with quality beds and mattresses. * Bedrooms are spacious and can accommodate extra people with roll-out beds. * Lots of space on our 750+ acres and in our four residential building plus the Events Building. * Basketball area on a concrete pad by the Events Building. * Ping pong table in three car garage at the main house. * Pool table in the same three car garage with the ping pong table. * Two fully equipped kitchens. * In the main house garage is a commercial ice maker, large freezer, and a commercial refrigerator. * Events Building for your uses: Wedding Receptions, On-site Conferences, Parties, Workshop Staging Area, and other group events. Family reunion and a chance for all of us to say goodbye to Mom, Grandma, Great Grandma. We released wish-lanterns one night, and had a fantastic fireworks show another. Mom wanted her ashes spread in the desert, so we did a final farewell one night. Star gazing and planet hunting one night. Water balloon fights during the day. And of course, getting to visit brothers, nephews, and niece with all of their children was wonderful. We always leave with someone planning the next reunion. We all loved the Painted Pony, but don't know if we will ever make it back to southern New Mexico, I put in more than 5,650 miles driving, and the shortest distance anybody had to drive was 1,700 miles round-trip. The resort itself was everything advertised, plenty of space, nice rooms, pool, the stars at night, scorpions, coyotes, and rattlesnakes. We all loved it. We thank you so much for staying with us and for the great review. It means a lot to us that you had a great family reunion. Our family’s third year at the Painted Pony. It’s a great place! Beautiful, spacious property! Only minutes from hiking and bird watching in the Chiricahua’s. Swimming, basketball, and bike riding on site. Watched baby birds learning to fly on the patio. Saw a Sonoran Desert Toad catching crickets one evening. A wonderful experience overall. It will remain an annual event for our family. We had a family reunion on this property, it was a fabulous visit with everyone. The property manager took excellent care of us. The place is very well stocked, the cookware was very large so you might bring some with you. There are plenty of dishes, flatware, coffee cups and glasses. The pool was great, there is a wonderful library throughout the main house. The pool table and ping pongs tables got used a lot. It was very comfortable and relaxing. We highly recommend this place and would use it again. Our family's second year in a row at the Painted Pony. Truly an oasis in the desert. We highly recommend it! We have just arrived home in San Francisco after our three-weeks of travel in New Mexico. A great highlight of our trip was our stay in your Painted Pony Resort. Michelle was a gracious, knowledgeable, and exemplary host, taking care of all our needs—from an immaculate guesthouse, to firewood, directions, advice, knowledge about the local area, and overall care. Her hospitality made us feel wonderfully at home! My partner and I walked in the desert in the evening under star-filled skies and basked in the glow of the Chiricahua and Peloncillo mountains in the daytime, enjoying the extensive grounds of the Painted Pony estate, situated beautifully with stunning views of the surrounding mountains and plains. We wanted to let you know how pleased and well taken care of we were during our visit! We have been so enthralled by our stay at your property both last year and this that we would like to spend a full week next time. Thank you so much for your generous hospitality! Wow, this is great. Thank you so much and we are looking forward to your visit next year! You are a wonderful guest in all respects. Beautiful Property,Serene with breathtaking scenery! Bruce was very welcoming, very helpful! Air conditioning went out, had it fixed in record time! Linens and towels were very clean! Kitchen not as clean as I like, but Im pretty picky! Bugs were a problem but expected since it's a desert area. ALL IN ALL wonderful experience with plenty of room for the entire family! Thanks for the great review and so happy you had such a great time! Not sure what was not right with the kitchen since we went over a check list at check-in and the guests were asked to bring to our attention anything during their stay which they did not do. Painted Pony Resort is situated in the heart of the San Simon Valley near Rodeo, NM. Rodeo, NM is nestled in between the Chiricahua and the Pelencillo mountains and has been a boom town more than once thanks to cattle, minerals, and the railroads. The San Simon Valley and Rodeo, NM offer the perfect Southwest desert vacation spot. The weather has four gentle seasons and the area experiences over 300 sunny days per year. The region is rich in history from the early inhabitants around 1000AD called the Mimbre Indians to the travels of Coronado expeditions 500 years later on the way to the Colorado to the wild west cowboys of the late 1800's including the Earps, Curly Bill Brocious, Billy the kid, and the Clanton Gang. The Chiricahua Mountains are considered a hikers and birders paradise and offers an amazingly diverse range of micro-climates from the desert at the valley floor to an alpine climate as you climb through the range. The lower elevation Peloncillo Mountains are home to a plethora of desert wildlife and foliage and have some spectacular areas to hike and explore. In the town of Rodeo, NM you'll find a few nicely appointed B&B's, a general store, and the Rodeo Tavern where you can get a cowboy-size meal and a great steak. Being primarily a ranching area the locals are hard working and family oriented. They welcome newcomers and are always happy to see a new face. Don't be surprised if you get invited to a roping or out to gather cattle if you express even the slightest interest. The amateur astronomy community is strong with many astronomers residing in nearby Portal, AZ at the Arizona Sky Village. You'll find people in the area who are extremely eager to share their passion for astronomy with you. The basin and range province of southern Arizona and New Mexico is characterized by a series of north south mountain ranges which rise in sharp relief to the broad flat valleys between them making the area an excellent place to hike. With the Chiricahua mountains to the west and the Peloncillo Mountains to the east hiking is popular past time for both local residents and visitors. A family oriented activity, horseback ridding can add something special to a family reunion and we can put you in touch with local guides. Backyard astronomy is a favorite with our guests because of the low atmospheric interference and our location remote from the light pollution around towns and cities. For this reason, the night sky is outstanding and we are the perfect location to view the sky. Join other amateur astronomers around the world to behold the beauty of the heavens. Favorite observing targets are the Moon, Planets, open clusters, and multiple stars. If you are an amateur astronomer it would be best to bring your own equipment. However, we do have a basic telescope you are welcome to use. The Chiricahua Desert Museum in Rodeo, NM (5 miles from the resort) is owned and operated by Bob Ashley and is NM's premier rattlesnake educational outreach and exhibit. The Ashley conducts educational field trips for Family Reunion's and have a wonderful art gallery, animal display and gift shop. The Boot Hill of New Mexico is famous for ancient Indian archeology. If you want to dig in the dirt, find things that are lost, put together pieces of the past, figure out stories from clues, and learn about the past, then we can point you in the right direction. You will find artifacts on our 300+ acres as well as other sites within driving distance to investigate. We can also put you in touch with locals who will be happy to show you around. The Sky Islands of the basin and range region of the southwest are exceptional sites for bird watching or observing general wildlife. The north south orientation of these mountain ranges provide migratory corridors between Central and North America at elevations up to 10,000 ft. In addition to endemic species found year round, migrations of a number or sub tropical rare species move through the area at different times of the year. 375 avian species have been identified in and around the Chiricahua Mountains and many local naturalists maintain feeding stations to attract local birds. A number of commercial operations offer birding tours as well as local naturalists, or you can strike out on your own into the Coronado National Forest, with a stop by the American Museum of Natural History Southwest Research Station to update your species checklist of the Chiricahua Mountains or New Mexico. There are many exciting and rewarding day trips you can plan while staying at PPR. We are located about 75 minutes North of the historic mining towns of Bisbee and Tombstone, AZ. On your way down stop at the Geronimo Roadside Monument and drop by Douglas, AZ and have lunch at the famous Gadsden Hotel. We are 90 minutes South of the beautiful Gila Wilderness & Cliff Dwellings. You should also visit the Spectacular Chiricahua National Monument. Maximum occupancy 40 people. Rates discounted to equal $35 per person once you reach $1,000 per night. Rate for 40 people would come out to $1,400 per night. By booking you agree to our Terms and Conditions.